Genealogy is a hobby of surprises, and one such surprise came this morning when I received the Marriage Certificate from Eliza Bowers (d.1915) and her husband, Horace William Basham (1833-1931). Eliza and Horace are my GG-Grandparents. I know this as they are both referenced in the birth certificate of their daughter Elizabeth Ann Basham. On top of this I’m lucky that Horace has such a wonderfully unusual first name, which means tracing them through they census returns is a low-risk occupation. As part of my genealogical research this year I’m focusing on identifying the ancestors of my known ancestors (that makes sense, right ?). I’ve therefore been hoping to identify the parents of Eliza Bowers which, until the Marriage certificate arrived this morning, I believed to be John and Mary Bowers. It came as a massive shock to see Eliza’s father named as Thomas Thompson, something that has left me rather confused. Let’s look at the evidence. Firstly we should start with the Marriage Certificate itself. Two important points to note here. Firstly Eliza Bowers is described as a Spinster, so this is not a widow re-marrying with her first husband’s name. Secondly there is no indication that Thomas Thompson is dead, so we should be able to trace him in the 1851 and 1841 Censuses. As I mentioned before, I had long assumed that Eliza was the daughter of John and Mary Bowers. There was, after all, only one Eliza Bowers in 1851 census that fitted her age, where she lived and a likely birth-place. This is Eliza is living in Brandon with her parents, John and Mary. Looking through Eliza’s census later records there were conflicting records of her birth place. In some cases I suspect there “errors” are due to a lazy census enumerator, who found out where the head of the family was born, then just assumed his wife was born in the same place. Eliza’s list of her census birth locations is as follows: 1861 – Brandon, Suffolk. 1871 – Santon, Norfolk. 1881 – Santon Downham, Suffolk. 1891 – Not Found. 1901 – Brandon, Suffolk. 1911 – Brandon, Suffolk. Whilst there is a fair mix of places here, the most common location is Brandon, Suffolk. A month ago, I bought a copy of the Baptism records for Fordham Deanery of Suffolk from the Suffolk Family History Society. When I looked up Eliza Bowers, baptized in Brandon, I fully expected to confirm Eliza’s parents. Indeed they were there, however the next record was for another Eliza Bowers born a few months later. This second one listed Elizabeth Bowers as the mother, with no father recorded. The full records are shown below. Having received the marriage certificate it began to look like Elizabeth Bowers was the mother of Eliza. What has really clinched this though is that I have found this record from the 1851 Census. There is also a record from the 1841 Census with Thomas, Elizabeth and Eliza (see below). In that record both parents are recorded as being 25 years old, although the 1841 Census ages were supposed to be rounded to the nearest 5 years. If she was really that old in 1841 then Elizabeth could well have been only 16 when Eliza was born. I feel reasonably confident I’ve now got the correct parents for Eliza. The fact I got it wrong for so long shows how dangerous it can be to make assumptions when researching your family. In particular, the assumption that if there is just one record for an ancestor (i.e. the 1851 Census record for Eliza Bowers) it must be the correct one is clearly wrong. I’ve always like Eliza Bowers. She’s one of the few women among my ancestors who was ever credited with having an occupation (a Fur Cutter – probably of rabbit pelts). I’m therefore pleased to have (IMHO) identified her real parents. Hopefully I can now stretch my Thompson and Bowers ancestors further into the past. I’m still not 100% certain that Thomas Thompson is the father of Eliza. 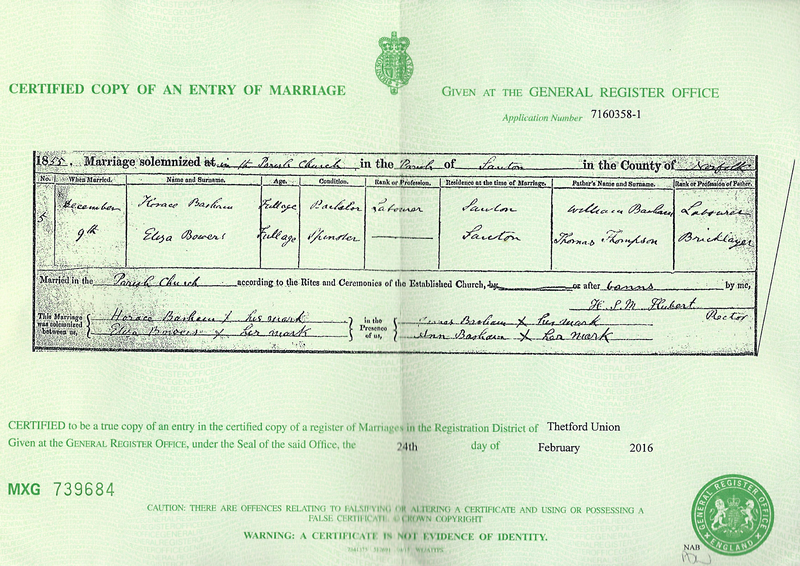 I’ve seen family trees on ancestry.com that have Elizabeth Bowers and Thomas Thompson marrying on 2nd December 1839. This is supported by the freeBMD website. That is over 7 years after Eliza was born. Did Thomas really wait 7 years before “making an honest women” out of Elizabeth ? If this is the case then I must say I’m rather disappointed in my ancestor. I don’t think it’s easy being a single-parent in any age, let alone in the early 19th Century Britain. An alternative, that I’ve seen before, was that Thomas “adopted” Elizabeth’s existing children when he married her. As a result the children, like Eliza, often end up in the censuses with the surname of their adopted father. Another possibility is that Thomas and Elizabeth were living together but didn’t get married straight away. This may have offended the sensibilities of the local church. It’s interesting that Eliza’s younger brothers Henry and Robert don’t appear to have been baptized (or at least not in Brandon). Younger siblings, Maria (b.1843), twin-sister Hannah (b.1843) and William (b.1847) were baptized. Perhaps the church only baptized those children born after their parents were married. Any thoughts on Thomas Thompson ? Is he Eliza’s biological father ? Please feel free to use the comments section below. This entry was posted in MyFamily and tagged Bowers, Brandon, Suffolk Genealogy. Bookmark the permalink.